Specialist of precision instrumentation, AOIP also offers related verification and calibration services through SOFIMAE, in-house service company that is 100% subsidiary of AOIP. *Ranges, domains, uncertainties and validity of the accreditations are available in the opposite section and on COFRAC website at www.cofrac.fr. Two levels of services are offered: COFRAC or non COFRAC with traceability to national standards. In order to help you choose between the two levels of services, please consult the guide. Technical traceability: Delivering a COFRAC calibration certificate ensures traceability of calibration results to the International System of units (SI). COFRAC calibration certificate or COFRAC test report ? Two types of documents can be issued according to your needs: a COFRAC test report or a COFRAC calibration certificate. In order to choose the suitable document according to your needs, please consult the guide below that is generally accepted. It is issued from the application of NFX 07-010 and NFX 07-011 French standards, as well as of AFAQ and COFRAC rules and recommendations. A comparison to a standard whose traceability to national or international standards is ensured is absolutely necessary. SOFIMAE performs a statement of measurement points on the instrument and compares them to a calibrated standard. It will enable the user to directly evaluate the conformity of the measurements according to his own requirements and to eventually make corrections. After testing the instrument, SOFIMAE issues a COFRAC test report, summarizing the calibration results. The document states the instrument complies with the manufacturer or client specifications. It can be delivered with or without the list of points tested. 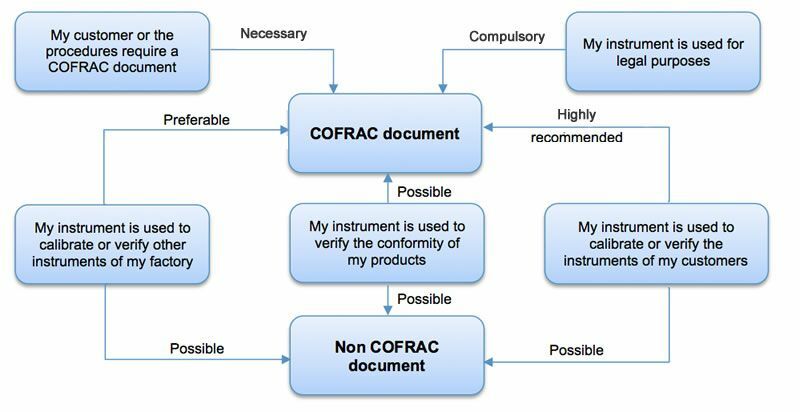 A non-compliant instrument is adjusted to the original specifications (when possible). The COFRAC test report shows the following verdict: the instrument tested does or does not comply with the specifications stated in the manual and applicable standards. The ranges beyond specifications are clearly identified and values of points are given. The calibration and the edition by SOFIMAE of a calibration report are performed according to the French standard NFX 07-011. The instruments used for measurements are directly connected to the national standard by the laboratory. The proof of traceability is supplied together with the test report.